Escape to Oahu’s Windward side! Imagine coming home to this exquisitely renovated beach cottage in the charming coastal town of Kaaawa. Watch the sunrise from your lanai, or gaze at the cliffs of the Koolau mountains from the big lawn outside your front door. This light and airy tropical home features open beam ceilings with 2 bedrooms and spacious loft (for 3rd bedroom or large office). The impeccably remodeled kitchen, perfect for entertaining, features all new cabinets, stainless appliances and quartz counter tops. PLUS fresh new bathroom. The shared sparkling blue swimming pool is professionally maintained, and has a covered barbecue area for you to enjoy. The ocean is just steps beyond your private lanai. Must See! 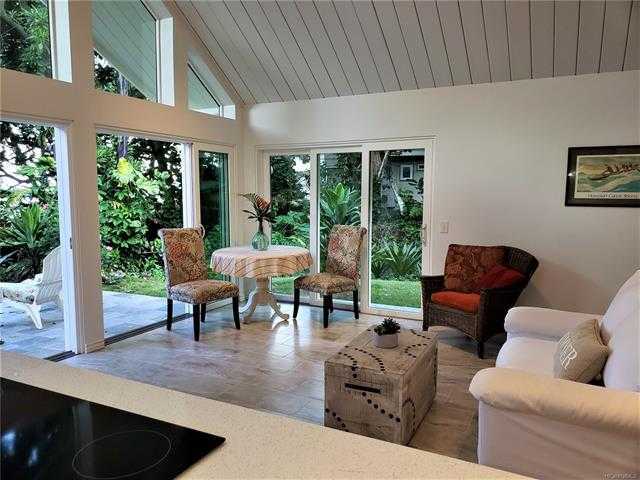 I would like to schedule a showing appointment for this property: MLS# 201828997 – $860,000 – 51-529 Kamehameha Highway Unit 6, Kaaawa, HI 96730.